If there is one major problem with this issue, it is that there is far too much recap of the events in Infinity that tie-in to what’s happening right now on Earth with the Terrigen mists. And there is a lot of talking, a lot of it. This might quite possibly be Matt Fraction’s most verbose issue and all that text takes away from the story, since too much information is front-loaded, and the art ends up suffering as well. Still, Fraction does well in giving the reader an overview of where things have gone before, and where they are all going in the immediate future. 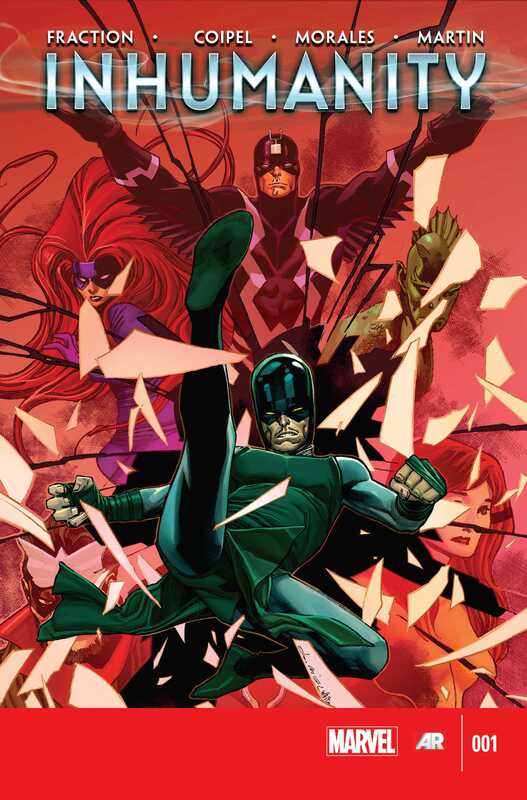 The “protagonist”, so to speak, of this issue is Karnak, one of the Inhumans and an advisor to Black Bolt, the King of the Inhumans. He is both the narrator and actor of this story. The Avengers find him somewhere in New York on the streets, babbling his mind out about something and they bring him in to talk about what was the whole deal with the Terrigen Mists and everything else. When Medua, Black Bolt’s wife, steps in and asks where her husband is, that’s when things are kicked up a few notches and we really start to see Karnak develop into a solid character. The most revelatory element of the story is that the Inhumans have been living among the general Human population for generations, thousands of years even. Kree genetic experiments, they rebelled against their masters and then mingled with the Humans. How this all comes about and how it affects the future of both species is the major plot point of the issue and I quite liked that entire angle. For someone like me who doesn’t know much about the Inhumans other than what has been shown in Infinity, this issue helps fill in those gaps and explains what the Inhumans are all about. So that was a good thing. The issue has a tragic ending, one that I did not see coming, but it is one that is quite… logical, given what happens throughout. Fraction definitely ends things on a good note. The artwork for the main issue is provided by Olivier Coipel, inker Mark Morales and colourist Laura Martin. I last saw Coipel’s work on the early issues of Brian Wood’s X-Men and he did a great job on there with how he drew all the X-Women and how his panels and pages visually brought life to Wood’s script. He does much the same here and his visuals are certainly captivating. It also so happens that his style is quite similar to that of Infinity‘s lead artist, Jerome Opena, and stylistically, it all matches up. It helps that Mark Morales is on this issue, since he partnered with Opena as well. So there’s a strong sense of thematic continuity that I liked. Laura Martin’s colours eventually take the show however and I loved her work here. I would like to see her do more and am hoping that that happens soon. Together, they provide some really great moments in this issue, such as the Terrigen Mists engulfing people everywhere and the spontaneous mutations and genetic changes that various people go through. Or the body language of several of the heroes, all of which builds up a great scene on every page. But that’s not all. The parts of the story where Karnak tells the history of the Inhumans are drawn, inked and coloured by Leinil Yu, Gerry Alanguilan and Israel Silva. And the parts of the story where Infinity flashbacks are used, we have Dustin Weaver and Israel Silva on the art duties. There are few, if any, breaks in the consistency of the artwork as a whole. This is another of the book’s strengths and I’m quite relieved that we don’t have a mess of styles here. And given that the scenes tell a story of a really grand scope, all the artists together deliver on that vision. Any problems that I had with the issue were largely those related to the scripted narrative and not with the art. Regardless, this was a good one-shot and if you are looking to jump on to reading Marvel comics with this issue, or want to touch base for Inhumanity for next year, this is a good place to start, all things told. Posted on December 10, 2013, in Comics Reviews, Review Central and tagged Avengers, Black Bolt, Comics, Comics Review, Infinity, Inhumanity, Inhumans, Karnak, Laura Martin, Mark Morales, Marvel, Marvel Comics, Matt Fraction, Medusa, Olivier Coipel, Review, Review Central. Bookmark the permalink. 10 Comments.